Matt Aranez comes to the Cycling Center after holding a similar position at Catholic Charities in Utah – a refugee resettlement agency – where he coordinated a massive volunteer mentor program for immigrant and refugee youth going through resettlement. 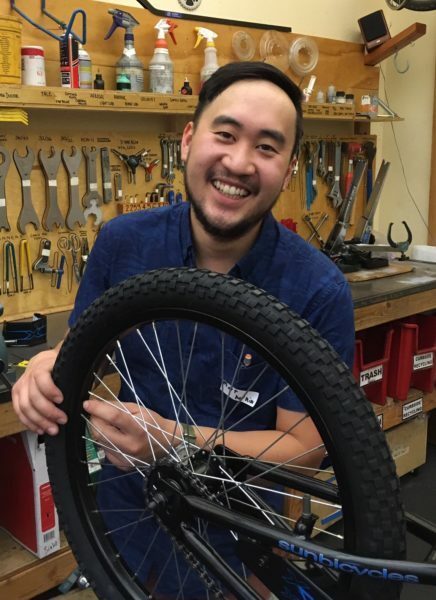 Matt is eager to bridge his passions for helping people find meaningful work and volunteer experiences with his love of biking. He noted that bringing his energy to such a progressive organization is what he’s most excited about. And though Matt typically drinks just a single cup of coffee a day, this week, his first on the job, he’s logging close to four! So if you need a favor of our new Volunteer Coordinator, now might be the time to ask!